The psychology department’s web page contains information about application procedures, the structure of the graduate program, and other information for prospective applicants. Our department was established in 1888 and has a long, distinguished history. This site has fascinating information about the equipment used in the lab of our department founder, Joseph Jastrow. (His “exposure apparatus” looks like a repurposed guillotine!) The department ranks highly on the usual surveys; it ranked first with Harvard and Princeton on the National Research Council survey. You can read about our strengths in the cognitive, developmental, social, clinical, perception, and biological/neuroscience areas on the department web page. We have a particularly strong core of people with interests in language (MacDonald, Seidenberg, Saffran, Alibali, Lupyan, Gernsbacher, and Rogers), plus additional close colleagues in other departments (such as Susan Ellis-Weismer and Rita Kaushanskaya in Communicative Disorders, and Ed Hubbard, Mitch Nathan, and Chuck Kalish in Educational Psychology), state-of-the-art neuroimaging facilities, and a friendly, stimulating, challenging environment. 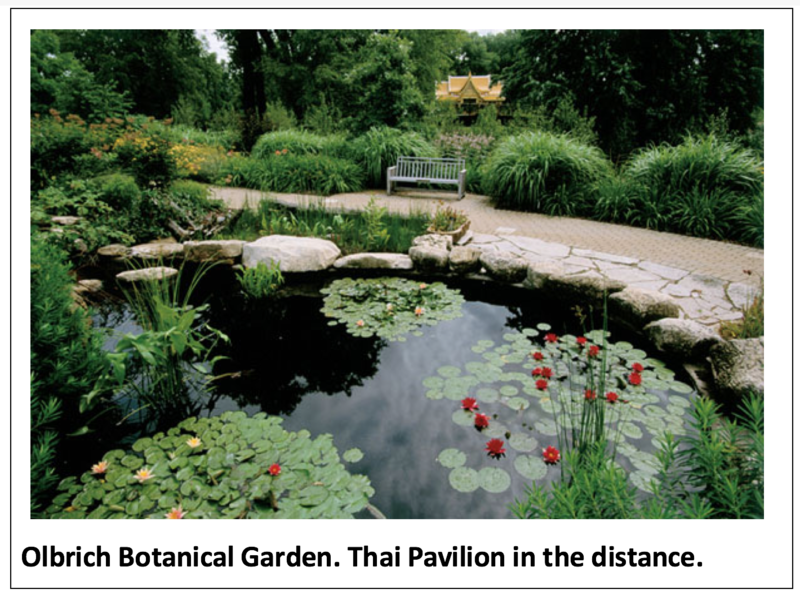 Madison is a comfortable and pleasant place to live and work, especially if you like the “active outdoors” lifestyle. 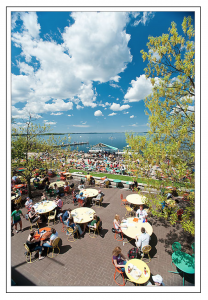 The university is situated on Lake Mendota, one of a chain of several lakes (the adjoining Lake Monona is where the late great Otis Redding’s plane went down many years ago). 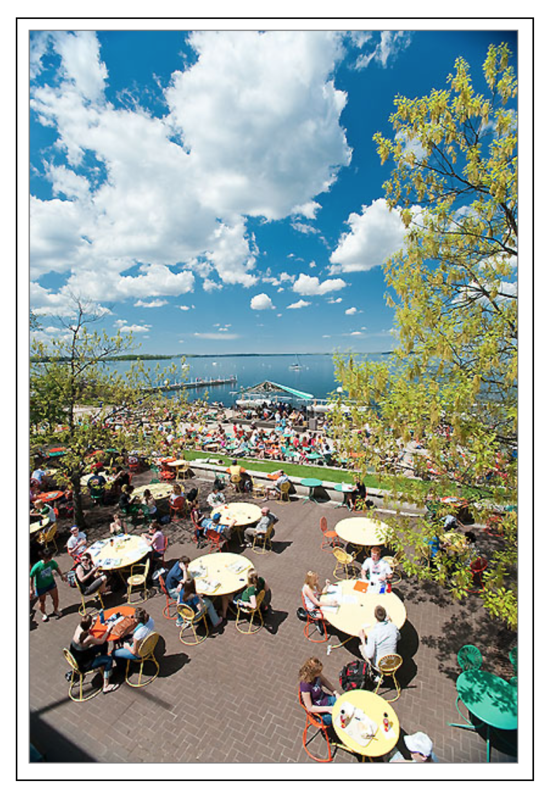 The Memorial Union Terrace (pictured; click to enlarge) is where people go to w atch the sun set and have a beer or some of the ice cream made on campus. Many pretty pictures here. People do a lot of bike riding; there are serious paths all over town and in the surrounding area. There’s also sailing, canoeing, running, and winter sports. Somehow, a number of graduate students in our program find time to train for marathons, triathlons, and ironperson events. There are good restaurants (especially for a city this size), the largest outdoor farmer’s market in the country, and many fine artisanal cheeses to go along with local favorites like cheese curds (they squeak). Most of what you really want to know about where to eat, drink or hear music is listed in the weekly publication the Isthmus, which has a good web page. Contact the students for more information about what life is like here. It may be “flyover” country to the people on the coasts, but it’s a desirable place to live. About the weather: People assume the weather in Madison is harsh because they’ve seen Green Bay Packer playoff games in late December on TV (they take place in Green Bay, 2+ hours north). The Madison reality is that sometimes it’s very cold and usually it isn’t. We get the same amount of snow as Boston and more sunshine than Pittsburgh. It’s warmer in San Diego, for sure. The countryside has rolling hills; once you adjust your eye to the beauty you can see why Frank Lloyd Wright located the original Taliesin studio complex nearby. When it snows, it’s easier to deal with in a moderate-sized town where you don’t have to drive. There’s also less pollution and a high level of eco-, social, and political awareness. In short: people live quite comfortably here and for many the climate and local ecology are part of the attraction. If you’re mainly interested in close proximity to beaches or base jumping, you’d be out of luck, but you probably also wouldn’t be going to graduate school in psychology. All graduate students work full-time toward their degrees, and are fully supported as long as they are in good standing. Support comes from multiple sources. Students are funded under the research grants that support our work. Many people obtain NIH or NSF predoctoral fellowships. Entering students are automatically considered for (and many are awarded) University fellowships. Students with interests at the intersection of psychology and education have been supported under the Interdisciplinary Training Program in Education Sciences. On the cognitive/developmental neuroscience end, there is the Neuroscience Training Program. Stipends are competitive with other programs and are intended to allow you to live reasonably and focus on progress toward your degree. You don’t get rich on an NIH pre-doctoral stipend, but you don’t go into debt, either. Additionally, in order to gain teaching experience, each student will typically have a teaching assistantship at some point in his or her graduate career. We invite applicants to campus for a visit in early spring; you spend 1-2 days (expenses paid) learning about the department, meeting faculty and students, and getting a sense of what the intellectual and cultural environments are like. We have had many outstanding students at MIT, McGill, USC, and UW. Our students typically have backgrounds in psychology, computer science, linguistics, and/or neuroscience. Strong computational/quantitative skills are important; knowledge of another language or dialect of English is a big plus. Prospective students should feel free to contact Professor MacDonald, Professor Seidenberg, and current graduate students for additional information about the program.